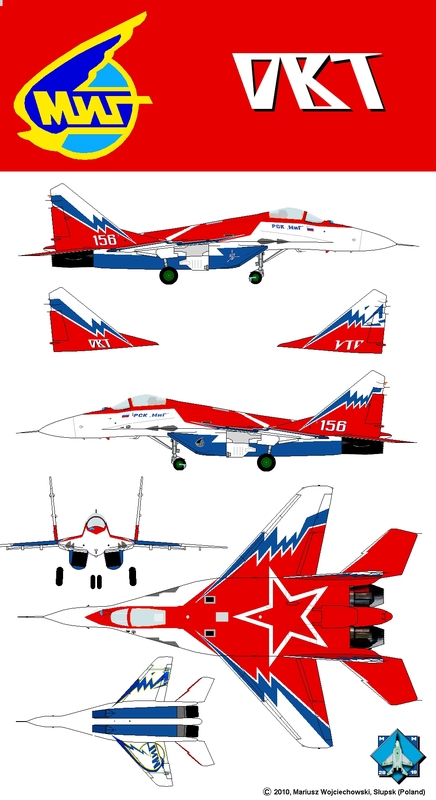 The product 9-15 it's a prototype of multi-role MiG-29M from end of eighties and beginning of nineties. 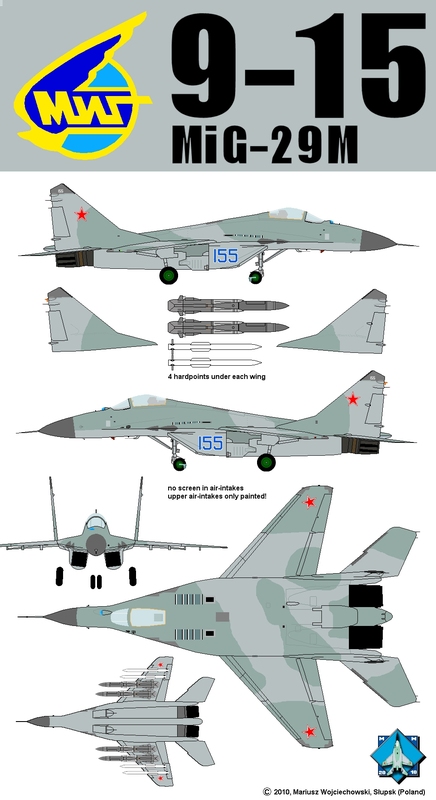 Six aircraft (#151, #152, #153, #154, #155 and #156) were produced between 1986 and 1991, prototypes of MiG-29M. 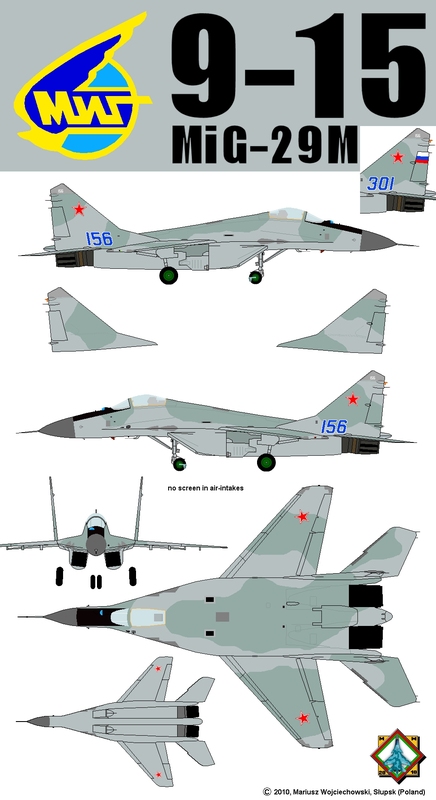 Later project 9-15 was abandoned (after 1991), and some aircraft were re-used by MiG bureau in the beginning of 21 Century: #154, completely rebuilded #155 and #156. After terminating of the MiG-29M project fate of the aircraft unknown. 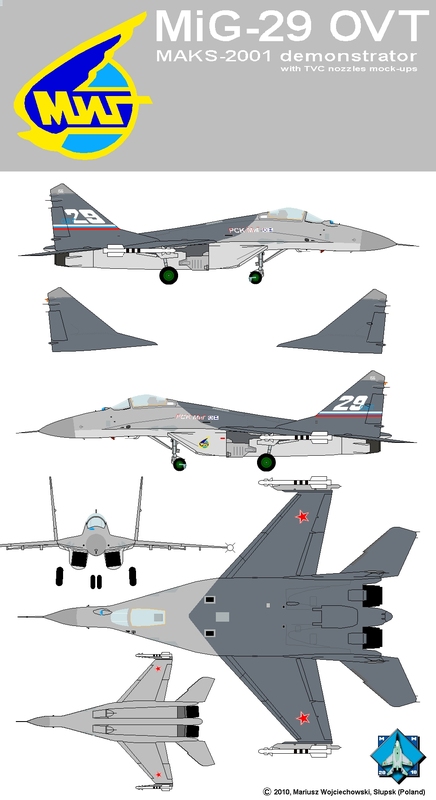 Fourth prototype of MiG-29M in 2001 became the "MiG-29MRCA" for Indian Multi-Role Combat Aircraft tender, between 2005-2006 it was "MiG-29M2", since January 2007 it's a "MiG-35". 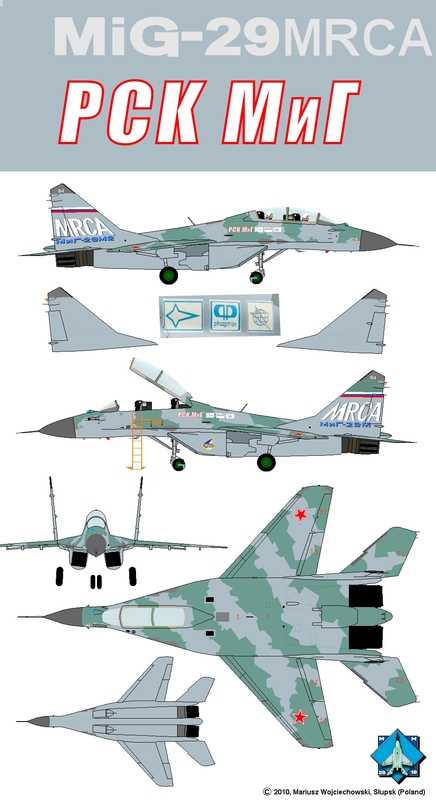 So called "MiG-29MRCA" #154, Russia 2001. A true mile-stone in MiG-29 story, for the first time MiG-29 so strong changed, new cockpit was built-in! Drawing accuracy: 100%. So called "MiG-29M2" #154, Russia 2005. Drawing accuracy: 100%. So called "MiG-35" #154, Russia 2007, still then in Indian tender, in December 2008 equipped with "Zhuk-AE" radar to meet Indian specifications, March 2009 participated in Aero-India 2009. Drawing accuracy: 100%. 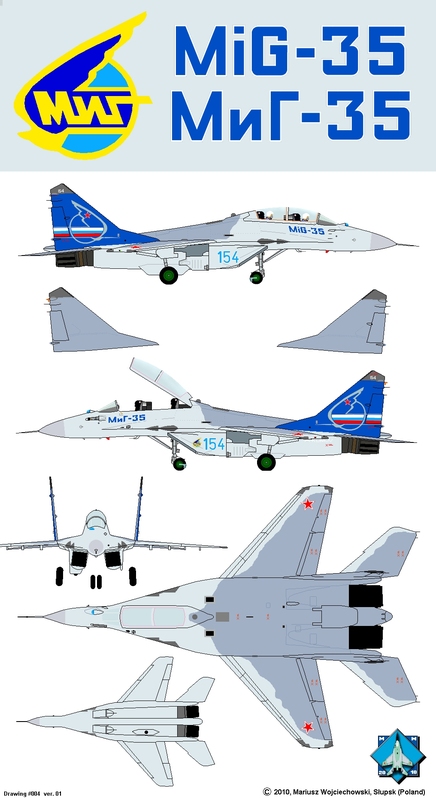 Fifth prototype of multi-role MiG-29M, bort number 155, about 1992-1995. All prototypes looks similar, but camouflage shapes are different on each. Drawing accuracy: 100%. After years, in 2007 fifth prototype was entirely rebuilt, into product 9-47 (MiG-29KUB) with folded wings, arresting-hook and new cockpit. First flight in February 2007. 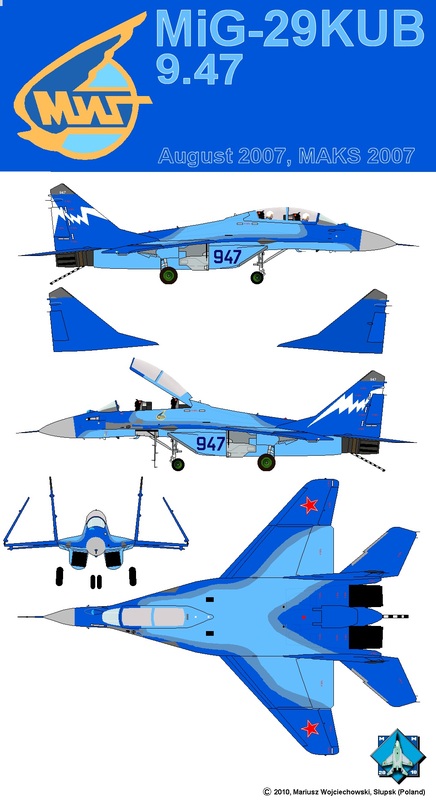 Product 9-47, Russia, MAKS-2007, airframe is rebuilt 9-15-5. Drawing accuracy: 100%. Sixth prototype of multi-role MiG-29M, bort number #156, about 1992-1995. Drawing accuracy: 100%. In 1998 served as MiG-29ME prototype with number #301 (small "156" still were on fins). In 2001 reworked to MiG-29M OVT (Отклонение вектора тяги ОВТ, deflection of the thrust vector OVT) with engines RD-33 (RD-133) equipped with movable nozzles developed by Sankt Petersburg Plant named after Klimov and called Климовский вектор тяги КЛИВТ, Klimov's thrust vector KLIVT. Aircraft was in grey painting. In fact, during MAKS 2001 exhibition it was only a demonstrator with dummy-nozzles, real engines with TVC nozzles were installed later. MiG-29M OVT 156, Russia 2001, demonstrator with R-73 missiles on wings. Drawing accuracy: 100%. In 2003 reworked again, fully equipped and repainted to well-known white-red scheme with big star on back. A real star of many airshows. MiG-29M OVT 156, Russia 2005, first flight in August 2003. Drawing accuracy: 100%.